​David Trungale is the president and founder of the Tradertours study course. His work examines financial markets, which includes the research of stocks, options, ETFs, and commodities. David's trading approach underscores technical analysis and specifically focuses on trend following principles. While David aims to meet short-term goals for investors, he ultimately considers himself a big picture analyst. He is currently applying his technical strategy and utilizing options in order to adapt to market changes. This allows his subscribers to maximize their ROI during bull, bear, and sideways markets. The home study course also comes with an optional referral plan. When you purchase the home study course, you will be emailed a referral code, which you can use to earn $150.00 for every individual that you refer to this particular product. There are no restrictions, goals, or minimum number of people that you need to refer in order to get paid with this plan. ​ The video below shows a silver and U.S. equities forecast from 2013-2015. David Trungale called for higher stocks and anticipated that the price of silver would collapse by another 33%. 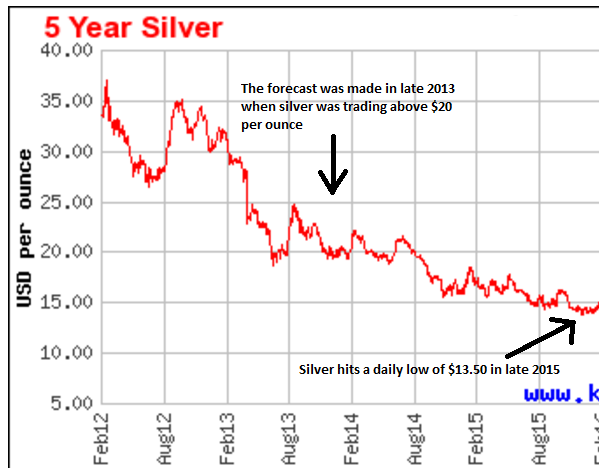 This particular silver prediction was within $1.50 per ounce.